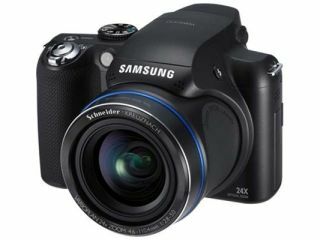 Samsung has announced the arrival of the WB5000, a camera that packs an almighty punch in the optical zoom stakes. Aimed at compact users who want a little bit more from their cameras, the WB5000 offers both 24x optical zoom and a 26mm wide angle lens, something that is unheard of outside of DSLR circles. Other specs include a Dual Image Stabilisation function, which combines both Optical and Digital Image Stabilisation into one feature, Face detection and Blink detection, and something called Smart Auto. You can also record 720p HD video at 30fps on to the H.264 format, and search through your images using the Face search option, which groups all images of the same person together. The 12.5MP Samsung WB5000 has a September release date, with pricing to be announced. Visit www.samsung.com/uk for more details.